Ivette Herryman Rodríguez was born on the Island of Youth, Cuba in 1982. She earned her Bachelor’s degree in Music Composition from the Higher Institute of Arts (ISA) in Havana, in 2006, and her Master’s in Music Composition at Baylor University, in Texas, graduating with distinctions in 2013. In 2017, Herryman completed a Master of Music in Music Theory and a Doctor of Musical Arts degree in Music Composition at Michigan State University (MSU). Her composition professors have been Juan Piñera, Scott McAllister, Ricardo Lorenz, and Zhou Tian. Herryman has written music for solo instruments, chamber groups, large ensembles, electronic media, children, church music, film music, and musical theater. Her compositions have been performed in important concert halls across Cuba, Mexico, El Salvador, Bolivia, United States, Spain, the Netherlands, and Japan. 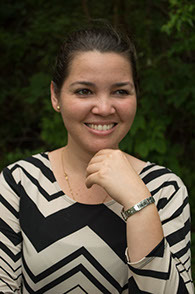 Her piece, Sigue, for women’s choir was published by Walton music in 2015 and became a best seller in the year of its publication, selling over 5000 copies. Her zarzuela, Cerca del Rio, was recorded by Colibrí productions in 2007 and won a Cubadisco Special Award in 2010. She is the receiver of the 2015-16 prestigious Brandon Fradd Fellowship in Music Composition given by the CINTAS Foundation. Her music is recorded on Colibrí productions and is part of the Naxos Music Library. Herryman has been Artist in Residence in Mexico and El Salvador. She remains active, composing for soloists, choirs, and chamber ensembles that commission her with frequency. Her professional activity also includes her work as a pianist and teacher of piano, composition, and music theory. Herryman has taught at the Higher Institute of Arts, in Havana, the Opera of El Salvador, and the School of Music at the University of Illinois at Urbana-Champaign. She is currently Assistant Professor of Music at Western Illinois University. • Dime alma mía, 2005. • Benediction (SATB) 2′, 2015. The Ball State Symphony Band with Dr.
Elizabeth Crawford as a soloist. Commissioned by Kevin Noe and the Pittsburg New Music Ensemble (PNME). Performance. Sutiles, for piano solo. Premiere. In the presence of beauty, version for tenor saxophone and piano. Performance. From El libro de los musiniños: Arcoiris, Homenaje a Carlos Fariñas, Nana de los musiniños, and Guitarra, for two pianos. Performance. By the rhythm of your truth, set us free. Performers: MSU professors Michael Kroth and Deborah Moriarty. Nov: “Son para Luis y Mara” (viola). Written for violist Mara Tieles. Premiere of the work On the inside, for viola and loop pedal in Amsterdan, The Netherlands. Written for Mara Tieles. Wharton Center, East Lansing, Michigan. Performance by The Harlingen South High School Combined Women’s Chorus. Harlingen, TX. November 24th: “Black Montuno” (piano and clarinet version), Performance by clarinetist Samuel Davies and pianist Ivette Herryman-Rodriguez in Cook Recital Hall. College of Music, Michigan State University.